In an online course, a frequent criticism is that PowerPoint’s are poorly designed and critical supporting information is often missing (with no presenter to fill in the blanks!) (Elder, 2009). On the other hand, instructional simulations combine multimedia elements (i.e. sound, images, video, etc) to represent (simulate) particular aspects of an actual situation (Hays, 2006). During the simulation, students interact with course content to achieve specific learning objectives. An active learning process occurs while students make sense of material through dynamic interactive experiences, similar to a game setting (Novak, 2012; Weimer, 2010). Adding gaming elements appeals to many students because attainable challenges and ongoing rewards are offered (e.g., point system) (Orlando, 2011). To sum it up, instructional simulations can be effectively integrated into both online and blended courses to help achieve learning objectives. Students can play simulation repeatedly (anywhere/anytime), are provided immediate feedback, and even have fun learning by using gaming elements that capture student’s attention and provide enjoyment! In this example, an instructional designer supported a faculty member in converting PowerPoint course material into an instructional simulation. 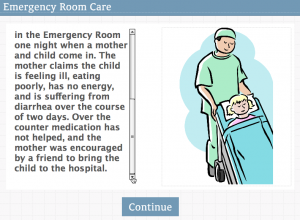 Here, course material was converted into an instructional simulation using a case-scenario and gaming elements to promote interactive learning. The student plays the role of a nurse in an emergency room and is challenged to apply course knowledge. The student’s score is tracked and feedback is provided. Hays, R.T. (2006). The science of learning: A systems theory approach. Boca Raton, FL: Brown Walker Press. Novak, J. (2012). Game Development Essentials (3rd ed.). Clifton Park, NY: Delmar, Cengage Learning. Ingel, G. (2015). Convert course materials into an instructional simulation using gaming elements. In Chen, B., deNoyelles, A., & Thompson, K. (Eds. ), Teaching Online Pedagogical Repository. Orlando, FL: University of Central Florida Center for Distributed Learning. Retrieved April 26, 2019 from https://topr.online.ucf.edu/convert-course-materials-into-an-instructional-simulation-using-gaming-elements/.